The Communist Party of China (CPC) is determined to make itself stronger to lead national rejuvenation which would be just "wishful thinking" without the Party's leadership. Xi Jinping delivers a report to the 19th National Congress of the Communist Party of China (CPC) on behalf of the 18th Central Committee of the CPC at the Great Hall of the People in Beijing, capital of China, Oct. 18, 2017. The CPC opened the 19th National Congress at the Great Hall of the People Wednesday morning. 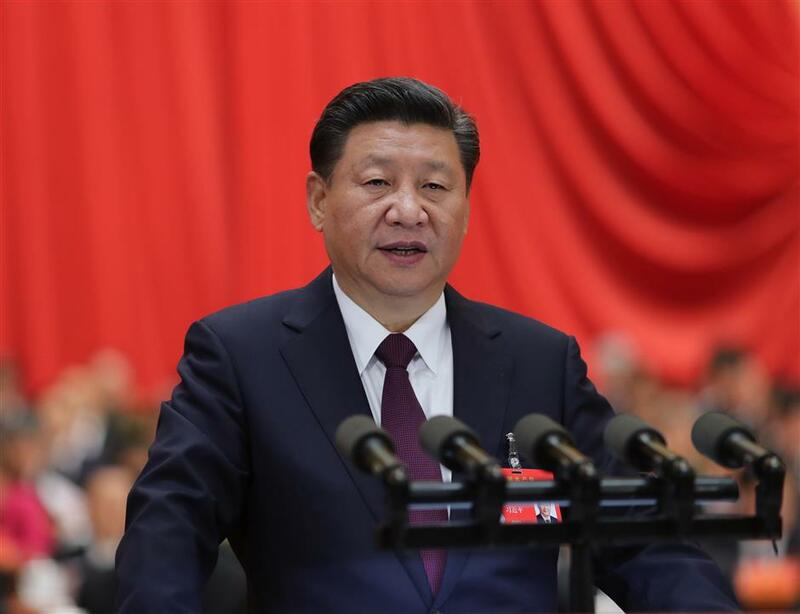 "We must unwaveringly uphold and improve Party leadership and make the Party still stronger," Xi Jinping said Wednesday at the opening session of the 19th CPC National Congress. The leadership of the CPC is the defining feature of socialism with Chinese characteristics and the greatest strength of the system, he said, calling the Party as "the highest force for political leadership." "We must keep on strengthening the Party's ability to lead politically, to guide through theory, to organize the people, and to inspire society, thus ensuring that the Party's great vitality and strong ability are forever maintained," he said. More than 2,300 delegates attended the congress, China's most significant political event in five years. Founded in 1921, the CPC has evolved from a small group of around 50 members to a 89-million member strong party, more than the population of Germany, with more than 4.5 million grassroots organizations. The Party has drawn up a plan to promote coordinated economic, political, cultural, social and ecological development. It also made strategic layout to make comprehensive moves to complete building a moderately prosperous society in all respects, deepen reform, advance law-based governance, and strengthen Party self-governance. Chen Shuguang, a professor with the Party School of the CPC Central Committee, said one of the major advantages of the Chinese political system is its ability to formulate long-term development plans and implement them in an effective manner. The Party is striving to strengthen its long-term governance capacity amid "complex" governance environment, Xi said, warning of the dangers of a lack of drive, incompetence, disengagement from the people, inaction, and corruption. "The future of a political party or a government is determined by whether it enjoys public support," he said. "We must guard against and correct with resolve the practices the people oppose and resent." Xi stressed arming the whole Party with the Thought on Socialism with Chinese Characteristics for a New Era. The thought is a "guide to action" that must be adhered to and steadily developed on a long-term basis for all Party members and all Chinese people in their to achieve national rejuvenation. The CPC will launch a campaign on the theme of "staying true to our founding mission" to instruct and assist all Party members to use the Party's new theories to accomplish the Party's historical mission in the new era, Xi said. The primary task of political Party building is to ensure that the whole Party obeys the Central Committee and upholds its authority and centralized, unified leadership, he said. All Party members must closely follow the Party's political line, strictly observe its political discipline and rules, and closely align themselves with the Central Committee in terms of political stance, direction, principle, and path. Last year, Xi was endorsed as the core of the Party at the sixth plenary session of the 18th CPC Central Committee. Analysts said the position is key for the Party and the country to keep on the right track of development. The Chinese need to unify around a core figure, a central leader, as their influence can unite the people and collect wisdom to formulate and implement suitable policies, said Professor Liu Dongchao with the Chinese Academy of Governance. The CPC pledged to make a sweeping victory in its fight against corruption to escape the historical cycle of rise and fall. Calling corruption "the greatest threat" the Party faces, Xi said the situation in the fight against corruption remains "grave and complex." The Party reaffirmed its stance of zero tolerance for corruption, saying both those who take bribes and those who offer them will be punished. The CPC will prevent any interest groups from arising within the Party, Xi said. Wherever offenders may flee, they shall be brought back and brought to justice, he added. The Party will work for the adoption of national anti-corruption legislation and create a corruption reporting platform that covers both disciplinary inspection commissions and supervision agencies, Xi said. The Party will enhance deterrence so that officials dare not commit corruption, strengthen the institutional cage so that they have no way to commit corruption, and raise their consciousness of staying away from corruption, he said. Since the 18th CPC National Congress, more than 280 centrally-administered officials were investigated. More than 1.4 million official received punishment. Supervisory commissions will be established at the national, provincial, city, and county levels to ensure that supervision covers everyone in the public sector who exercises public power. A national supervision law will be formulated. Supervisory commissions will be given responsibilities, powers, and means of investigation in accordance with law, Xi said.